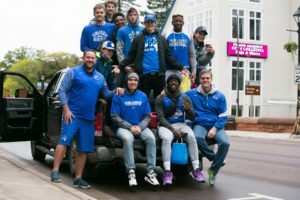 All Finlandia University and Suomi College alumni are invited back to campus for the 2019 Homecoming celebration, October 3-5, 2019. We’re still finalizing all events for the Homecoming Weekend which will include an Alumni & Student Social Hour, Campus Tours, Alumni & Student Lunch, the Spirit & Traditions Pep Rally, an Alumni Dinner, Homecoming Parade, and multiple sporting events. Be the first to know the full schedule of events by signing up for the Alumni & Friends Monthly E-Newsletter! Finlandia has worked with several local hotels to offer discounts to alumni for the Homecoming weekend. Alumni need only mention they will be staying for the Finlandia Homecoming weekend when making a reservation to receive the discount. The university has blocked off rooms at all hotels listed below.